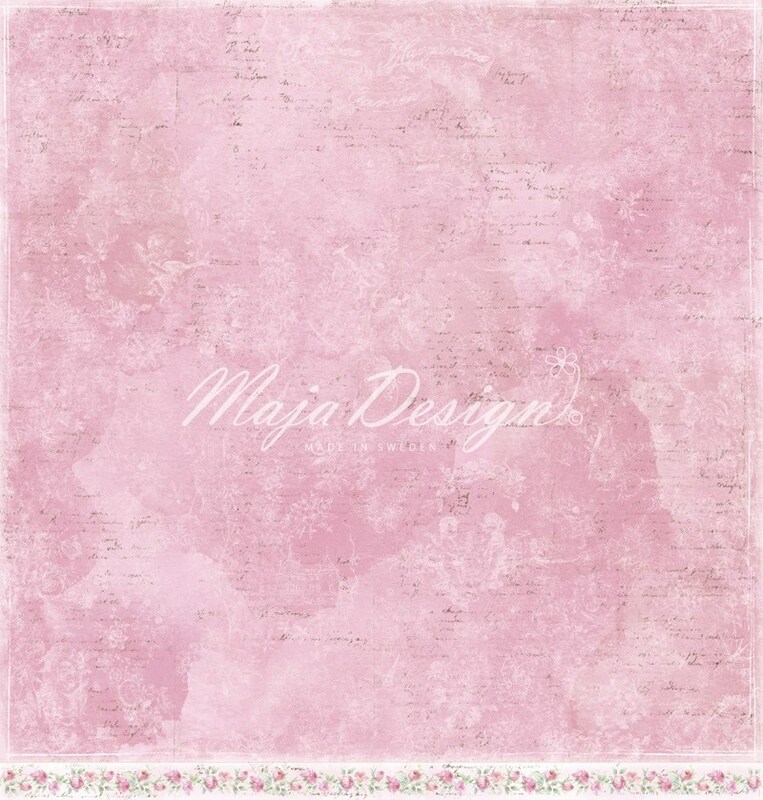 A big big welcome back to the home of Maja Design. 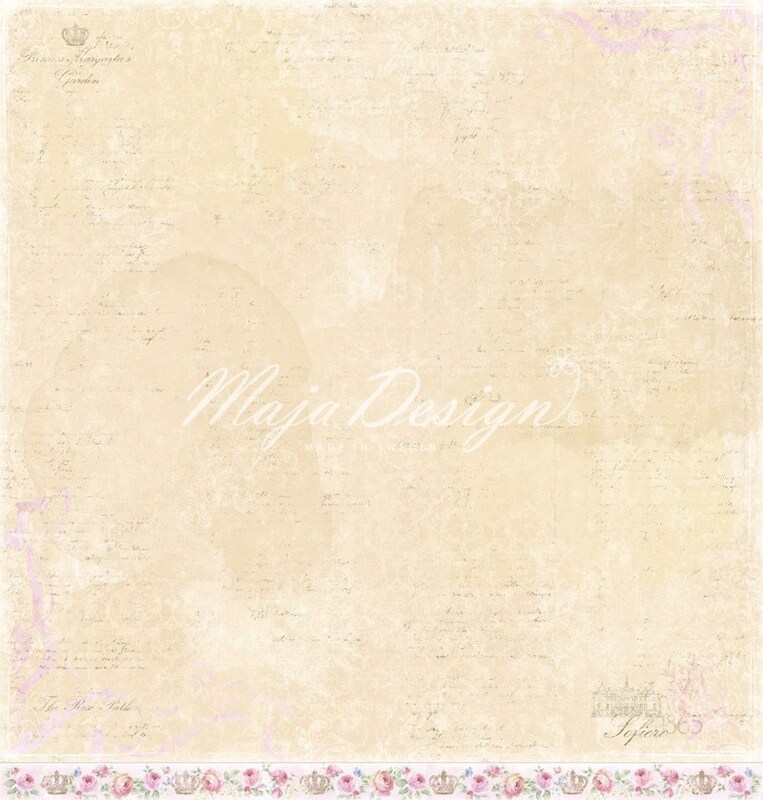 Today I have for you my next Maja Design Team creation. It was so exciting to hear that “Soferio” an old favourite was being reprinted into a new edition with an additional Die Cut Sheet and Monochromes. 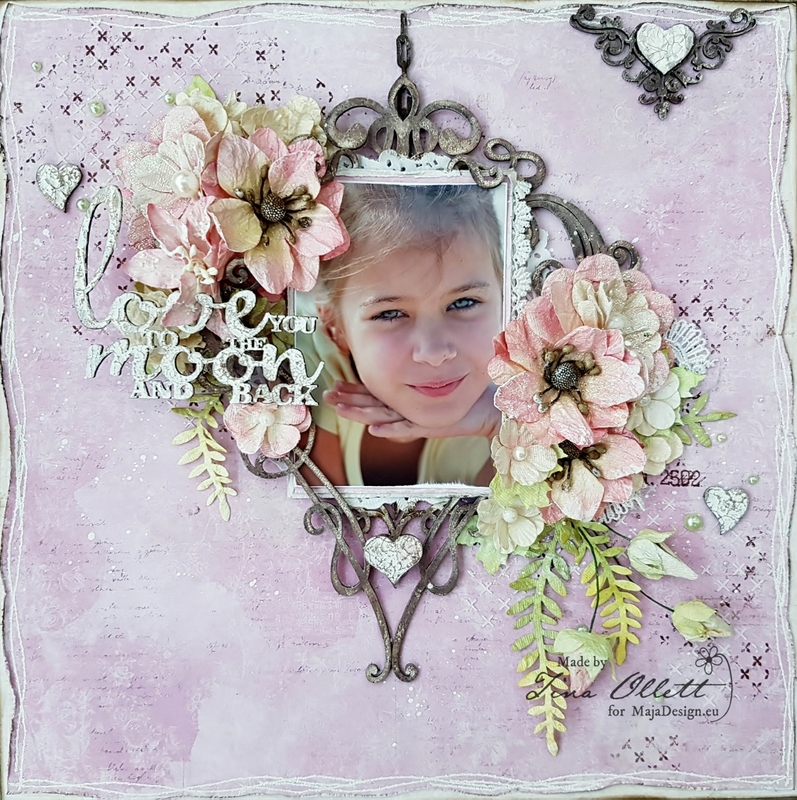 “Love you to the moon and back”……..
As soon as I saw this first sheet of the collection called Strolling down the rose path, I instantly knew that this was where I would start. 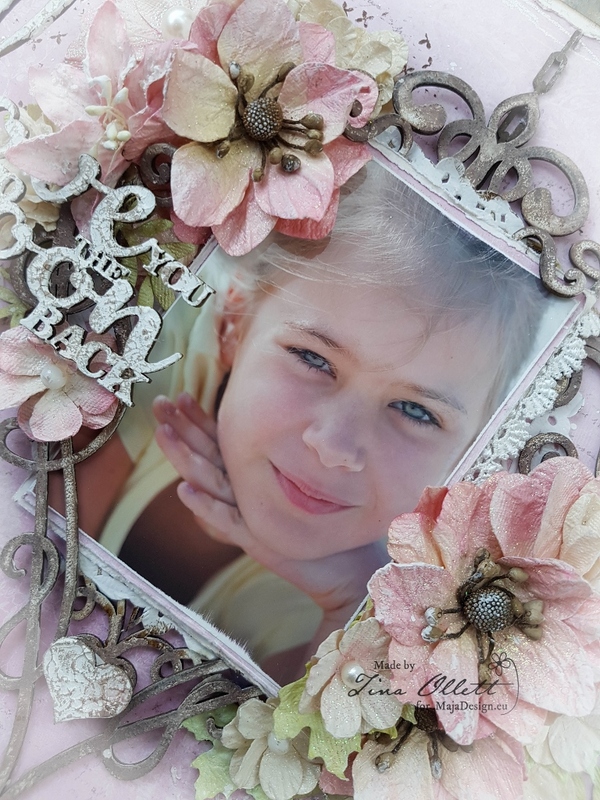 I teamed it with “Enjoying the fragrance” to create this lolly coloured layout of my gorgeous girl. 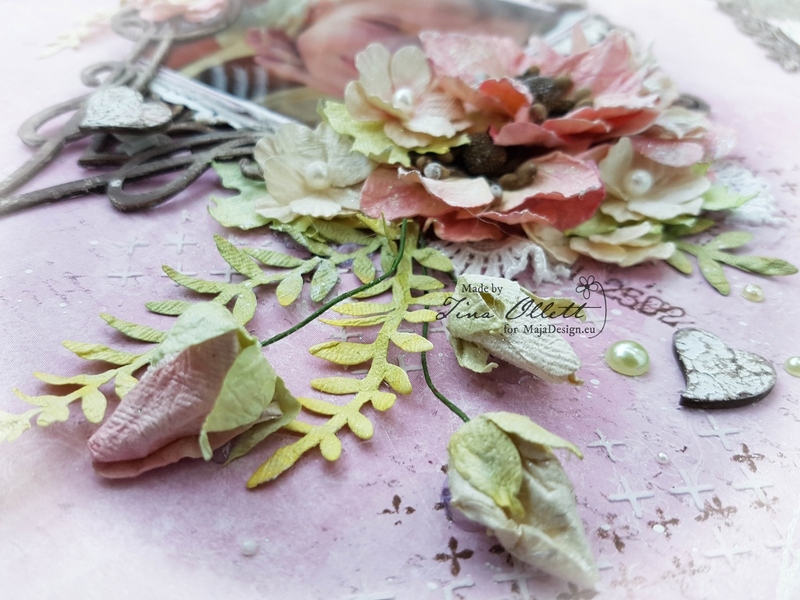 My starting point for this layout was to stamp and stencil with texture paste the background of Enjoying the fragrance. 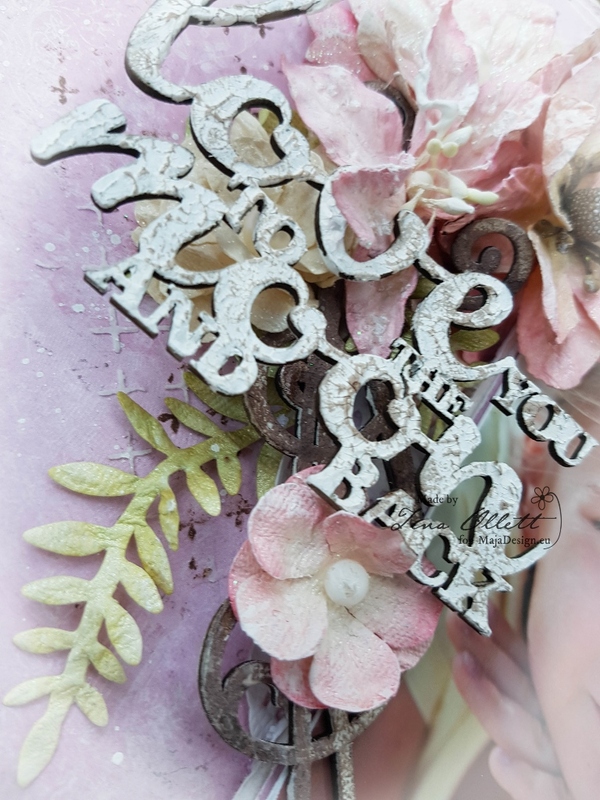 I have used Distress Ink Ground Espresso with a 49andMarket Stamp – Ethereal Stamp Set. The edges of the paper were also stamped and powder embossed with another 49andMarket Stamp Set called Gabi’s Line Stitch . Once this was heat set I cut a wavy pattern from around the stamped image and then backed this to Enjoying the fragrance bs. My photo was matted using pieces from the 6 x 6 paper pack of the same papers. They are so darn cute perfect for matting this sizing of photos. As you can see above I have also tucked in some small snippets of miscellaneous lace I found sitting on my desk. 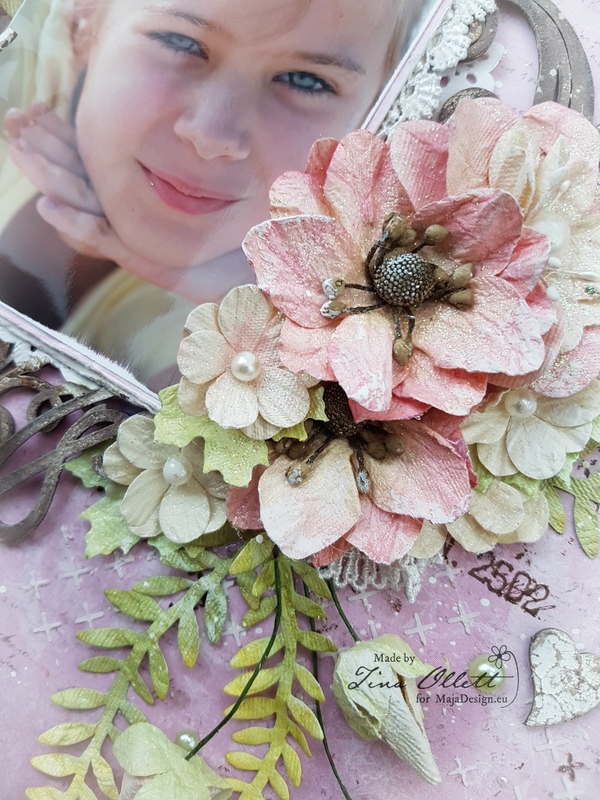 My photo and paper matting were sat upon some Dusty Attic chipboards that I put together to make a unique heart shape frame. These chipboards were gessoed and then inked randomly with Ground Espresso Distress Ink. I also rubbed a little Liquid Pearl “Blush” over and around the edges to pick up on the pink shades from the papers. My Dusty Attic title “Love you to the moon and back” is a very special saying that my gorgeous girl and I have used for each other for as long as I remember. So it was only fitting to use it here. This was dressed in Finnabairs Art Extravagance Texture Paste White Crackle. Once it was dried I rubbed in some of the Blush Liquid Pearls and then rubbed over the textures with a little more of the Distress Ink. 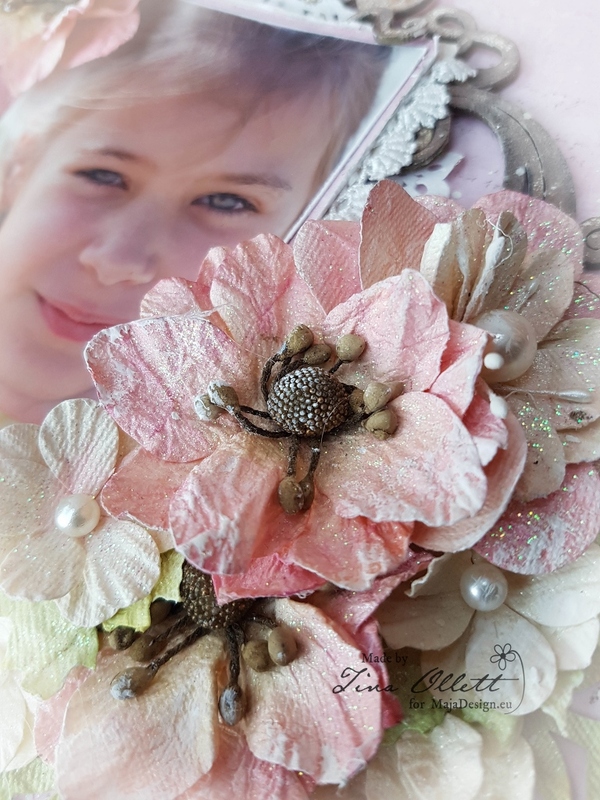 My clusters of flowers that I have used here are the newest of the 49andMarket collections. Shimmer and Shine in both the Blush and Ivory Melange. They compliment these papers perfectly! And one more sneak peek! For your convenience I have made a full and complete list of the materials used for this creation below. I hope you have enjoyed my layout today. As I said before I have another coming up using this same beautiful beautiful collection. I can’t wait to share it with you! Until then happy scrapping. WAUW sooooooooo beautiful lay out here with your gorgeous and lovely daughter. I just absolutely LOVE, how you´ve mixed all this and got this stunning piece of art. It is soooo sooo beautiful and sooo well made in every little detail. Stunning work, well done.